We continue to peruse all of the wonderful pictures from Instagram with the hashtag #AppalachianTrail and #AppalachianTrials and select a few of the best each week. This week we take a look at photos snapped between 12/01/14 – 12/08/14. If you would like your picture to be included, be sure to use the hashtag #AppalachianTrail and/or #AppalachianTrials (we give preference to this one). And follow Appalachian Trials on Instagram for even more AT love. @damnhawk1984 kicks off this week with some adventure planning. Every now and then Shenandoah just likes to pretend it’s the Smokies. @rufusb22 at Bear Church Rock in Shenandoah National Park. With Virginia finally behind him @brocarcj hits the home stretch! @krudmeister introduces us to another amazing person along the trail, Mary Parry of Duncannon, PA.
Mary Parry of Duncannon, PA was homeless in the 90’s. She was living at a campground on the edge of town and managed to scrape enough $ together to rent a place. Shortly there after she started giving hikers bananas when they came through town. That led to eventually welcoming them in her home. Homeless to hosting those who know no home. Thanks Mary! @hales.blevins doesn’t pass up an opportunity to make her adventure a little more exciting. @kristenmayx treats us to a perspective of Harpers Ferry infrequently seen by thru-hikers from atop the Maryland Heights Trail. Finally hiked this trail again. When I first saw this I thought I was staring at a Timberland ad. @kogie_bear finds his way back to his happy place. @kstewart0515 finds that the Smokies are still a little frozen over. Obligatory snowscape courtesy of @dnaleonard12. Sun rays beam through to shed a little light on @oneilr1. Need some added fiber in your diet? A pinch of some hiker spice, such as this example from @hal0_of_wint3r, will do the trick. This photo just makes me smile. @kayla1091 at Overmountain Shelter in North Carolina. If this photo from @gluethis doesn’t make you want to leap through your computer screen and start hiking then you need to take a long, hard look at your life. @fly522 and company break out their badassery and plow their way up the Crawford Path. Be sure to check back next week for more of that sweet, delicious #Appalachian Trail Instagram goodness! And remember if you would like your picture to be included, be sure to use the hashtag #AppalachianTrail and/or #AppalachianTrials (we give preference to this one). 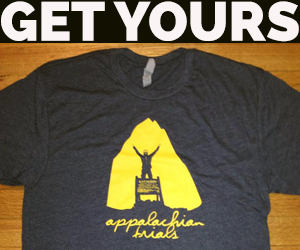 And follow Appalachian Trials on Instagram for even more AT love.